I did reviews about Greens+ Bar and chia seeds, but I have not yet had a chance to share my thoughts on Amazing Grass. I picked up a couple of sample packets after slurping up some samples of the chocolate flavor at Whole Foods. That sample was cold, chocolatey, and not very grassy at all. To fight mid-morning hunger, I often resort to drinks -- tea, decaf coffee, and stuff like this. At only 30 calories, I can get protein and other nutrients to stave off my hunger and perk me up. So as directed, I mixed the plain flavor with 6 oz. of water and was disgusted by all the things floating in the water. 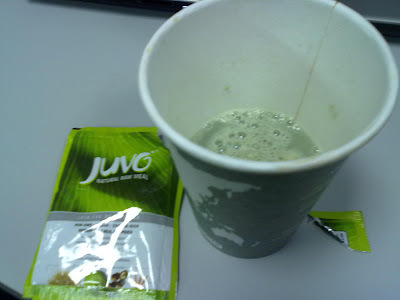 I mean, the taste was not great because I don't like spirulina, but all the debris made it unpalatable for me. Above: I have yet to try the berry one, and not sure when I will get hungry enough to do so. Agh, couldn't get the pic orientation to work, so lay down to look at this pic! So onto Juvo. It claims to be raw and developed by a holistic doctor. It has similar properties to Amazing Grass, except it's lower in protein because rather than focus on veggie protein, it contains veggies and fungi (shiitake?). This one didn't have debris and didn't taste bad. It has a weak flavor, kind of reminiscent of gruelish baby food (come on, you know you've tried it). However, the smell (dominated by mushrooms) was gag-worthy. Overall, I would rather hold my breath to avoid mushroom smell than choke on debris in my drinks. Perhaps these supplemental drinks are best thrown into smoothies to mask their flavors.